Chok Anan or “Miracle Mango” is a the most common mango cultivar in Thailand. I wish I could tell you that the mango soju sour I am going to share with you today was infused with miracle mangos, but the fact is, it was made with a cultivar from the USA, the nearly ubiquitous Tommy Atkins. At the peak of its ripeness, this is not a bad mango, but it is far from the best. If you decide to make this drink at home, I highly, highly suggest that you use a better cultivar, such as my personal favorite, the Ataulfo. I have not actually tried a Chok Anan, but I think that would be even better, given the spirit of this drink (pun most certainly intended). When I first received news of the Thai cocktail challenge, I set out five infusions for my mixing lab. My infusions were Juniper, Bird’s Eye Chile, Mango Basil, Sugar Cane, and Kaffir Lime/Galangal/Lemongrass. Those of you who enjoy Thai food can probably anticipate tomorrow’s drink, based on that information. Sugar cane, by the way, was entirely underwhelming, and when I tried mixing it with orange juice, it was positively awful. Thus did I kiss my dreams of a Mai Thai good bye. I haven’t given up hope for the sugar cane infusion, but it pairs with orange juice about as well as garlic pairs with whipped cream. Maybe if you’re Ferran Adrià you can make that work, but I sure can’t. Juniper-infused soju may taste like gin, but sugar cane-infused Soju resembles rum only metaphorically. Anyway, I wanted this cocktail menu to feature an egg white sour, as I consider the genre to be one of the more interesting products of the modern mixology revival, and I figured we would pick some relatively unchallenging flavors. I infused a handful of Thai basil in this Soju for two days, and the flesh of a Tommy Atkins mango for four, and the result was a hint of basil on the sip, followed by a rich mango backend. Dry shake, and then shake over ice. 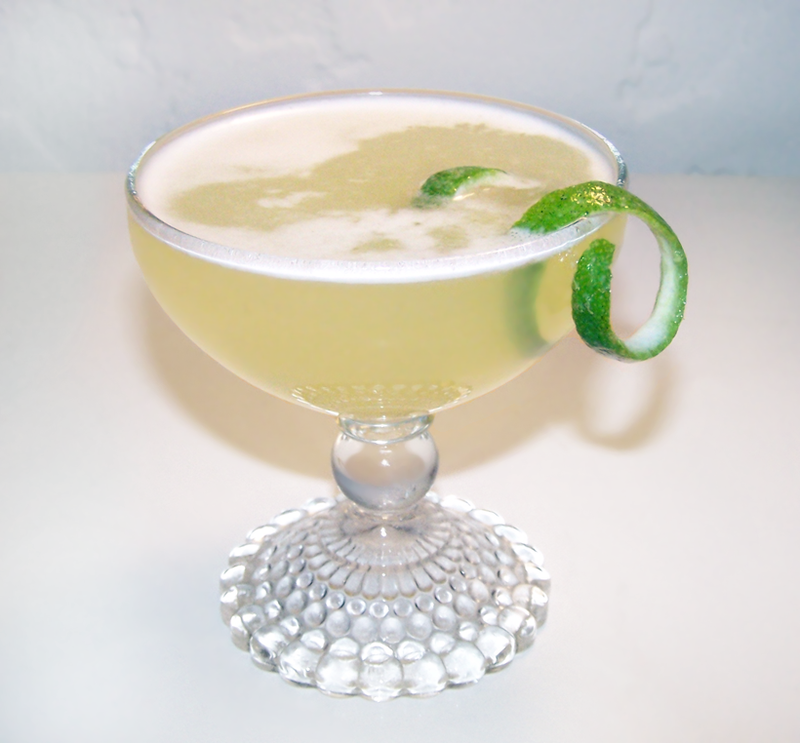 Strain into a coupe glass and garnish with a lime twist. In my original formulation of this drink, which is pictured, I used .75 oz each of lime juice and passion fruit syrup, and only .5 oz of egg white. As a result, the ratio of egg white to other ingredients was too low, and the drink did not acquire a pleasing foam head. Upon further consideration, I decided that the syrup and lime in my first version were too high, which is why I have presented a slightly scaled down version of the sweet/sour component of this drink. I believe that with this formulation, the .5 oz of egg white will be enough to froth correctly. Moreover if I had it to do over again, I would probably skewer a couple of mango cubes on a bamboo skewer, and wrap a lime twist around it. So, in summary: do what I said, not what I did, use a miracle mango to make the infusion, and garnish more artistically. There’s always a tradeoff with egg white sours between double-straining to remove any fine pieces of ice vs. creating a superior foam head. Different shaking techniques can minimize ice sharding, so we’ll probably have to talk about that soon. Categories: infusions, original creations | Tags: alcohol, bartending, basil, booze, cocktail, cocktails, craft cocktails, drinking, drinks, egg white, infusion, mango, mixology, soju, sour, thai | Permalink.